And yet, far from the hokey Toad Men or Stone Men from Saturn, the issue holds up impressively well, reading instead like a pastiche of sci-fi classics. 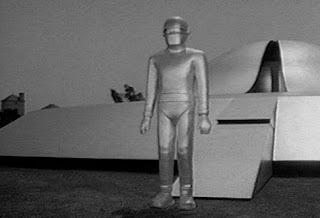 When the flying saucer lands on Earth and Kurrgo's robot walks out, one can't help be reminded of Gort from The Day the Earth Stood Still. 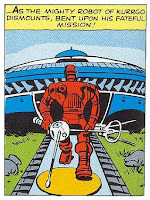 And Reed's inspiration of shrinking down a populace to enable planetwide evacuation has popped up variously over the years - although off the top of my head I'm only coming up with Doctor Who's 1966 story The Ark, and the end of Grant Morrison's Final Crisis in 2009. 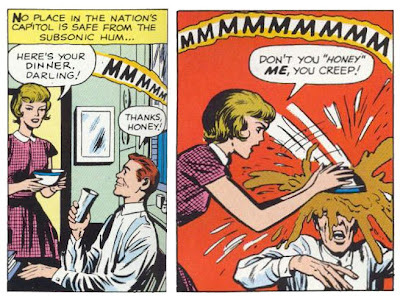 Can anyone come up with instances of that sci-fi trope that predate this 1962 issue? It's either an homage ... or a robot emerging from a spaceship. A theme to this issue seems to be that of "fame". 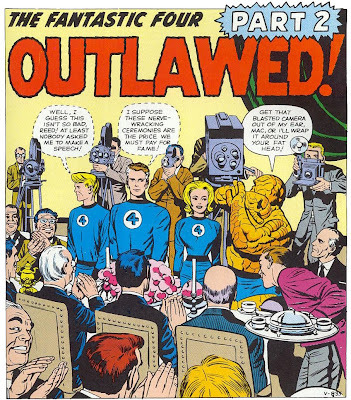 Superman may be loved by the people on the street, but here we see the Fantastic Four summoned to Washington to attend a government dinner honoring their achievements. 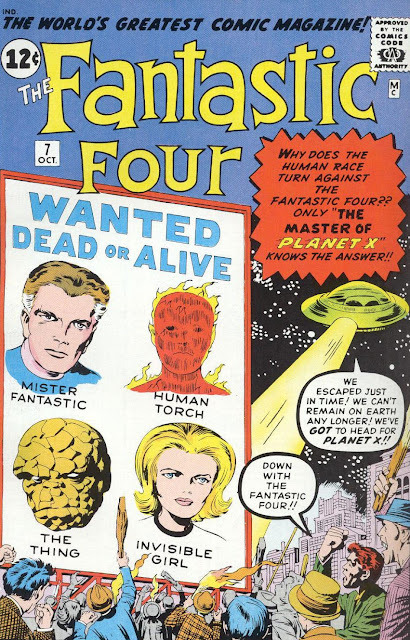 Sue, Ben and Johnny nonetheless all relate their own fears about committing some mortifying faux pas in the face of such public declarations - fears quickly forgotten when Kurrgo's hostility ray turns the people of Earth against both each other and the foursome! 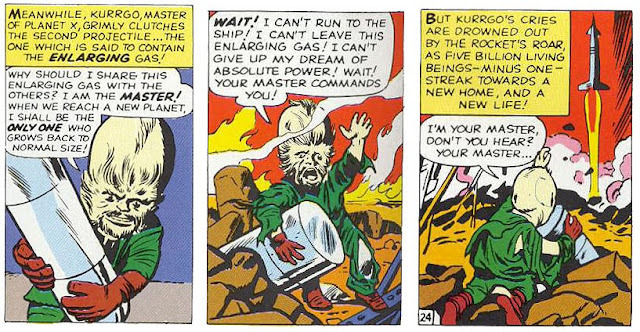 And, while unstated, it's clearly the fame of the FF's planet-saving deeds that propelled Kurrgo to seek the FF's help in the first place. Superheroes as celebrities was something rarely seen.